Elvis once recorded a song called, I think, “Fame and Fortune.” In it were the lines: “What good is fame and fortune? They are just fleeting things…” Elvis, of course did enjoy the fame and fortune about which he sang. And, he died at 42. They were for the king of rock and roll, indeed, just fleeting things. As one prophecy teacher I know says, “You’ll find that description of Judgment Day in the Bible in the same place you’ll find the story of Rudolph the Red-Nosed Reindeer.” Sadly, far too many Christians have no more idea of what God’s review of their lives will be like than that described above. This study is meant to help us understand, as thoroughly as God’s Word allows, what one of the major judgments following life on this planet will be like. Not only will there not be one long line where we stand in dread for a few thousand years awaiting our turn, but there will not be one judgment; there will be two. The first judgment to take place will be the bema judgment, also called “the judgment seat of Christ.” The second –the final judgment– will be “the great white throne” judgment. You do not want to be at the second of these two judgments–not unless you are there as witness to God’s righteousness, rather than as one who is being judged. You do, definitely, want to be at the first judgment. This is because only the saved stand before Christ at the first judgment, and only the lost stand before God at the second. Everyone at the first judgment will go into Heaven to live eternally in God’s presence. Everyone who stands before God in the second judgment will go into Hell, apart from God for eternity. Prophecy Power will cover the great white throne judgment in a later study. We will look at the judgment seat of Christ for now, to get a handle on exactly what Bible prophecy says awaits each of us who name the name of Jesus in the intimate way essential for salvation. The great apostle indicated that at the end of his own life he was satisfied he had given all he had for his Lord, who is also his Judge: “For I am now ready to be offered, and the time of my departure is at hand. I have fought a good fight, I have finished my course, I have kept the faith: Henceforth there is laid up for me a crown of righteousness, which the Lord, the righteous judge, shall give me at that day: and not to me only, but unto all them also that love his appearing” (2 Tim. 4:6-8). How thrilling! Did you catch that? Paul says in this prophecy that not only he, but we who run the race with all we have, will also receive great rewards. But he says more than that. 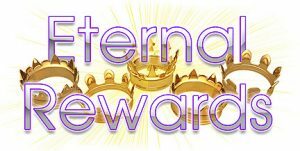 He prophesies that there is a special reward for Christians who “love His [Jesus’] appearing.” Now that’s an empowering truth for those who look for the Lord Jesus at any moment in the rapture! So, our immortal souls can never be in danger of facing God’s wrath, once we are upon the foundation, which is His blessed Son, Jesus. Nonetheless, our eternal destiny is still subject to influence, based upon how we live our lives while still in this realm of earthly existence. You see, we, when we are set upon that unshakable foundation–the Lord Jesus Christ—we immediately begin building on that solid Rock. We send the materials ahead of our trip to glory –whether that trip be through death or the rapture– for constructing our eternal dwelling place, and for making our heavenly wardrobe. In that sense, our works while in this life do affect our eternal destiny. The building materials we send ahead in the form of our works on this earth will have to pass God’s test to determine their worthiness for heavenly construction. The testing will take place at the bema –the judgment seat of Christ. Here’s what God’s Word has to say about that moment of testing for each of us: “For we are labourers together with God: ye are God’s husbandry, ye are God’s building. According to the grace of God which is given unto me, as a wise masterbuilder, I have laid the foundation, and another buildeth thereon. But let every man take heed how he buildeth thereupon. For other foundation can no man lay than that is laid, which is Jesus Christ. Now if any man build upon this foundation gold, silver, precious stones, wood, hay, stubble;Every man’s work shall be made manifest: for the day shall declare it, because it shall be revealed by fire; and the fire shall try every man’s work of what sort it is” (1 Cor. 3:9-13). Paul, under divine inspiration, is quick to tell us that this judgment in no way will determine whether the person being judged is allowed to enter Heaven. The one being judged is eternally secure from the very moment of salvation. Paul writes about the bema judgment further: “If any man’s work abide which he hath built thereupon, he shall receive a reward. If any man’s work shall be burned, he shall suffer loss: but he himself shall be saved; yet so as by fire” (1 Cor. 3:14-15).